1888: The Wandering Minstrel, with a crew of forty, wrecks on Midway Atoll’s coral reef during a quest for sharks. The stories of the survivors, including tales of murders, mutiny, escapes, buried treasure, and rescue from the Wandering Minstrel, General Seigel and other wrecks, inspires Robert Louis Stevenson’s novel The Wrecker. 1903: President Theodore Roosevelt places Midway Atoll under control of the U.S. Navy via Executive Order 199A in response to massacres of seabirds for feathers and eggs by poachers. The first transpacific cable begins operation and employees of the Commercial Pacific Cable Company settle at Midway Atoll. President Theodore Roosevelt issues the first round-the-world telegram on July 4, 1903. 1935: Pan American Airways begins constructing a refueling base at Midway Atoll, which consists of a wooden dock and a mooring barge in the lagoon where seaplanes land and discharge cargo and passengers. Pan American Airways clippers begin to cross the Pacific Ocean, arriving at Midway Atoll from Honolulu as a stop on the airline’s 5-day transpacific passage. 1939: The U.S. Navy expands its interest in Midway Atoll and millions of dollars are awarded to the Pacific Naval Air Base Consortium. Construction of the naval air facility at Midway Atoll begins the following year; architect Albert Kahn, one of the country’s foremost industrial designers, prepares plans for the buildings in 1940. The strategic importance of an air base at Midway Atoll is considered second only to Pearl Harbor. 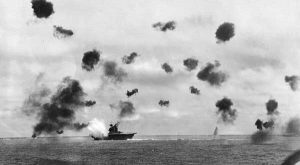 1941: Coinciding with the attack on Pearl Harbor, two Japanese destroyers shell Sand Island at Midway Atoll for almost 2 hours. The attack kills four Americans and wounds ten. 1947: Pan American Airways stops operations on Midway. 1950: Thousands of military personnel stop at Midway for refueling and emergency repairs as part of the Korean War effort. 1952: The Commercial Pacific Cable Company turns over its buildings and equipment to the U.S. Navy and ends all Midway operations. 1953: The U.S. Navy reactivates Midway’s naval air station. Construction begins on the Distant Early Warning (DEW) Line using radar to intercept potential aircraft or missile attacks on North America. 1957: Midway becomes a home for the Pacific portion of the DEW Line. Navy Seabees build a runway for heavy aircraft and an aircraft hangar. New housing, updates to the theater, and a new chapel are completed. 1968: Midway is a major aircraft and ship refueling stations during the Vietnam War. The atoll also hosts the the Sound Surveillance System, which uses miles of undersea cables and hydrophones to detect submarines. 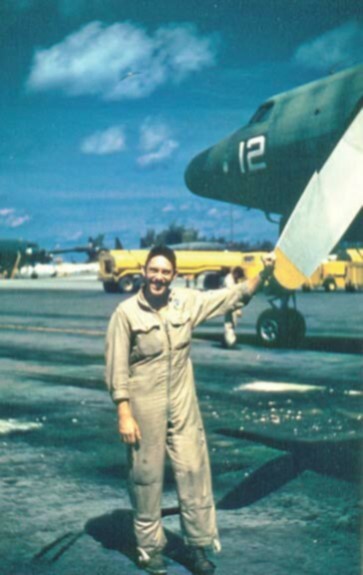 1981: A contract is awarded to civilian contractors to operate the naval air facility, further reducing the number of military personnel on island. 1986: Out of Midway Atoll’s 63 historic properties considered eligible for inclusion in the National Register, six defensive structures related to the Battle of Midway are listed together as a National Historic Landmark. 1988: United States Navy designates Midway Atoll as an overlay National Wildlife Refuge. 1996: President Bill Clinton transfers full jurisdiction of Midway Atoll from the U.S. Navy to the U.S. Department of the Interior through Executive Order 13022; Midway Atoll becomes a National Wildlife Refuge. 2000: Secretary of the Interior Bruce Babbitt designates Midway Atoll National Wildlife Refuge as the Battle of Midway National Memorial through Secretarial Order 3217. 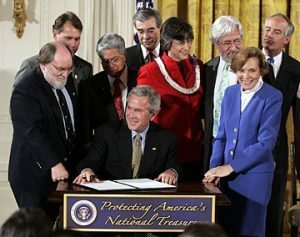 2006: President George W. Bush establishes the Papahānaumokuākea Marine National Monument, formerly known as the Northern Hawaiian Islands Marine National Monument, through Presidential Proclamation 8031 under the Antiquities Act of 1906. 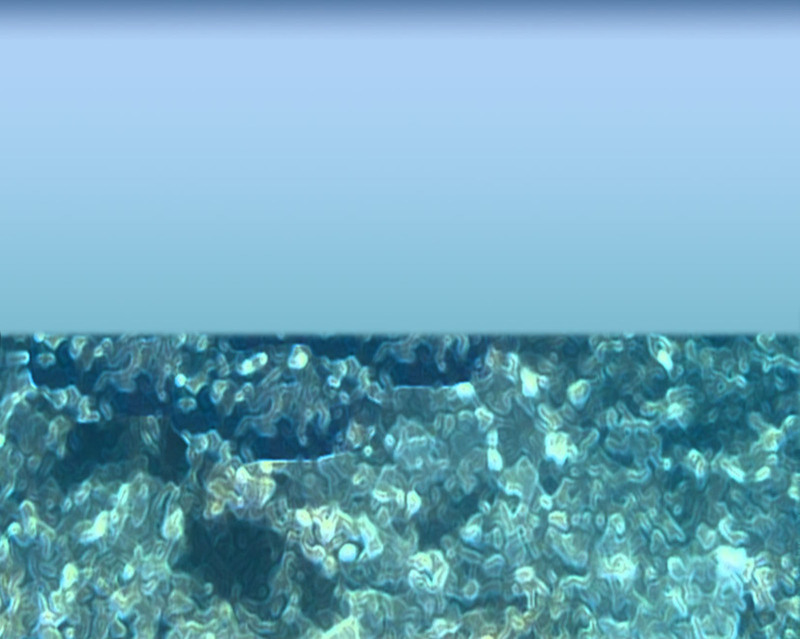 2010: Midway Atoll NWR is included in the designation of Papahānaumokuākea Marine National Monument as a World Heritage Site by the United Nations Educational, Scientific, and Cultural Organization (UNESCO). 2016: President Barack Obama announces expansion of the Papahānaumokuākea Marine National Monument and proposed visit to Midway Atoll NWR.